Haruna Yukawa’s involvement in illicit activities will complicate negotiations for his release. A bizarre story has emerged this week about a Japanese man, Haruna Yukawa, being captured in Syria, possibly by the Islamic State, amid reports that he was there as a photographer, as a mercenary, or as an arms supplier for Syrian rebels. His reasons for being in the war-torn area and his whereabouts remain unclear, and yet he is causing quite a stir in Japan both in the news and with the government. It is also unclear how the Japanese government may go about retrieving him, if indeed they deem it prudent once all the facts of his involvement in the area come to light. If Yukawa has been captured by IS, he will likely become a bargaining chip for the militant group, which has become quite adept at the business side of insurgency. While Japan has little in the way of assets or influence in the region, IS may attempt to use Yukawa as leverage to force concessions from Japan’s ally, the U.S. Such an attempt would likely prove unsuccessful and would leave Yukawa’s fate very uncertain. IS has shown no qualms about executing prisoners, which could put Japan in a difficult situation should it chose to make a play for his release. 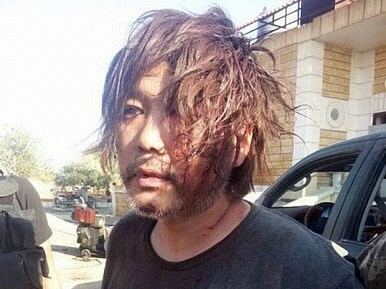 Reports began filtering out on Sunday that a Japanese man had been captured by militants in northern Syria near Aleppo, and a YouTube clip emerged of a bloody Yukawa being interrogated by off screen militants as to why he was armed and in Syria. He initially claimed to be a photographer from Japan, and that he had picked up the weapon from a dead soldier. It later emerged through Yukawa’s own YouTube channel that he claims to run a private security firm called Private Military Company, showing footage purporting to have been taken from both inside Syria and Iraq. The Asahi Shimbun reported on Tuesday that he told acquaintances he was going to the region in order to establish his new company. PMC claims to provide information gathering, security guards and transport services. Later on Tuesday, a regional leader of the Islamic Front spoke with Kyodo News about Yukawa’s whereabouts, said he had been captured by IS while with Islamic Front fighters and reporting on the conflict between the two groups. Yukawa told the militants he was interesting in supplying the rebels by opening an office on the Turkish border, while tracking both IS and the Syrian military’s movements. During the fighting, Yukawa reportedly became disconnected from the Islamic Front fighters as they retreated from a skirmish with IS in Marea, just north of Aleppo, and that he was likely captured in the confusion. IS has yet to confirm Yukawa’s capture through verified sources, and if he was, it is unclear whether his presence has been passed on to the group’s leaders. There is speculation that his situation is likely much more untenable if he is being held by low-level fighters. In response to this news, two Japanese foreign ministry officials briefed Chief Cabinet Secretary Yoshihide Suga, and the Vice Foreign Minister Akitaka Saiki told reporters “we are trying to verify the safety of this man through various channels.” Japan’s embassy in Syria (now located in Jordan due to the ongoing civil war) said it was attempting to gather information on Yukawa through staff that has stayed behind in Damascus, but that it has been difficult because there is no direct line of communication with the militants. Both the embassy in Jordan and the foreign ministry have set up task forces to gather information on the abduction, but so far there have been no results. Amid the conflicting claims as to why Yukawa was in Syria, and the audacity (if true) of his attempt to set up a private security firm on the Turkish border, this is a very difficult and sensitive issue for the Japanese government to attempt to resolve. Indeed, with very few diplomatic assets (to say nothing of security assets) in the region, the best Japan can hope for at this point is for a militant group, most likely IS, to claim his capture and ask for a ransom. However, even in that best case scenario, Japan may be asked to deliver something besides money, at which point Yukawa’s actions will play into the equation. Despite high-level reactions to the situation, Japan’s cursory attempts to gather information (with no mention of contacting allies to help in the search) show how important his return is to the government at this point.